This was really a token license ("certificate" in Australia. I stayed with Claude Gillard in Melbourne on my R&R (I wasn't suppose to leave the Sydney area.) and jumped with him and some of his friends at his jump certre in Labertouche. 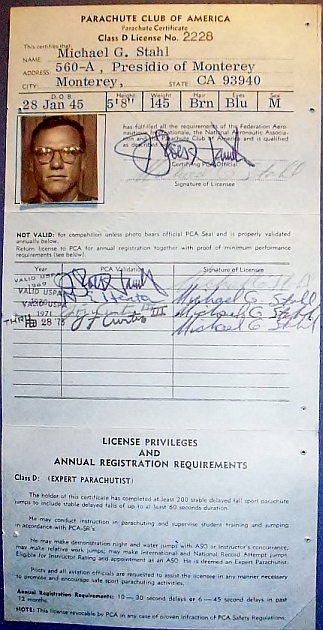 He had an executive position and was authorized to issue licenses. 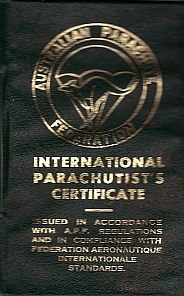 I joined the APF (Australian Parachute Federation). 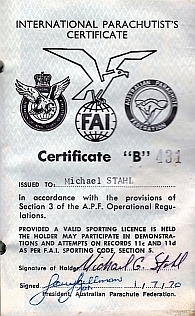 I asked Claude if I could get and Australian license and although I had a USPA "D" (expert), Claude said because all my qualification jumps had been made in the U. S., it wouldn't really proper to certify me with an Aussie "D" License, so he issued me this token "B" license. 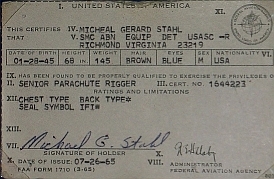 There were several members of the Ft. Ord Sport Parachute Club that were reassigned to Vietnam at about the same time I was there '69 - '70. Most of them were in the Saigon area. 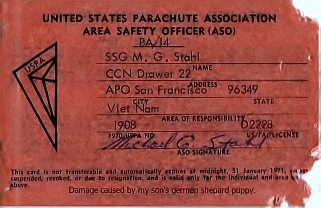 Jerry Ruburn (D-1100) organized the Sharp Chuters Sport Parachute Club. 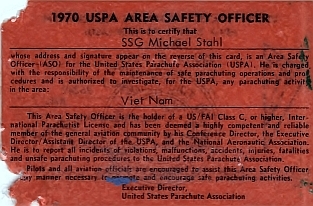 We wanted to be affiliated with the United States Parachute Association. Jerry got in touch with Norm Heaton, Executive Director of the association. 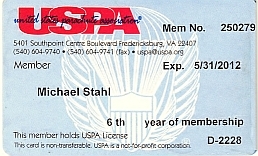 We all knew Norm very well as the USPA HQ was in Monterey, CA, just a few miles from Ft. Ord. Jerry requested that I be appointed the ASO (Area Safety Officer). Actually there wasn't much skydiving going on and I found it somewhat ironic to be a safety officer in a combat zone. 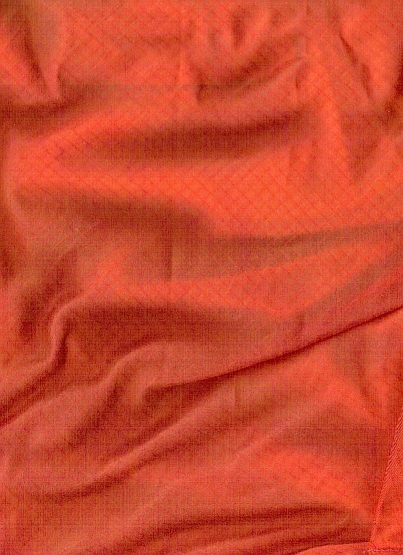 As fate would have it, the only official act I performed was getting a USPA "A" license for my friend, CPT V. V. Phat LLDB (Vietnamese Special Forces). Getting CPT Phat that license pretty much cemented out long lasting friendship. 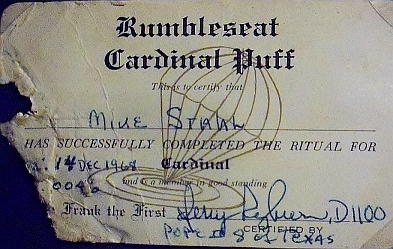 Cardinal Puff was a skydiver beer drinking game that was designed to make the person attempting to earn the rank of Cardinal very drunk. Earning the rank of Cardinal was played with a 12 ounce glass of beer. Earning the rank of Pope was played with a standard 64 ounce pitcher of beer.